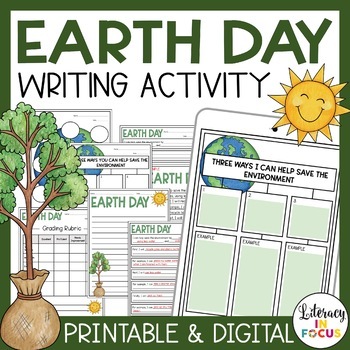 Everything you need in an Earth Day writing activity is included! 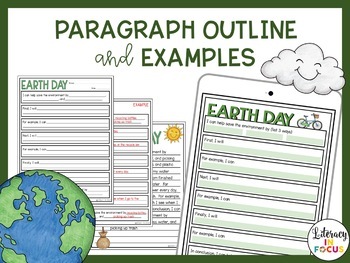 This comprehensive Earth Day writing lesson includes a relevant prompt, two graphic organizers, paragraph outline, fun Earth Day writing paper, grading rubric, and examples! 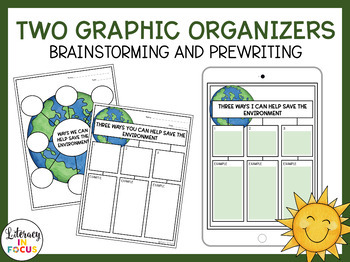 It's the perfect activity to reinforce writing skills and celebrate Earth Day! Bubble Map: Students can use the bubble map to brainstorm different ways to help save the environment. Pre-Writing Template: The prewriting template will help students organize their thoughts before they begin crafting their paragraphs. Paragraph Outline: The outline provides students with a sentence-by-sentence format for writing their paragraph. Writing Paper: The themed Earth Day writing paper makes for a fun and polished- looking final draft. 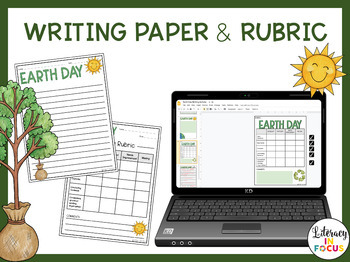 Grading Rubric: The grading rubric provides students with clear expectations for the Earth Day paragraph. Examples: An example of the paragraph outline and final draft are provided to go over with students as needed. Looking for an additional Earth Day resource? Click below to check out the Earth Day reading comprehension passages and activities.